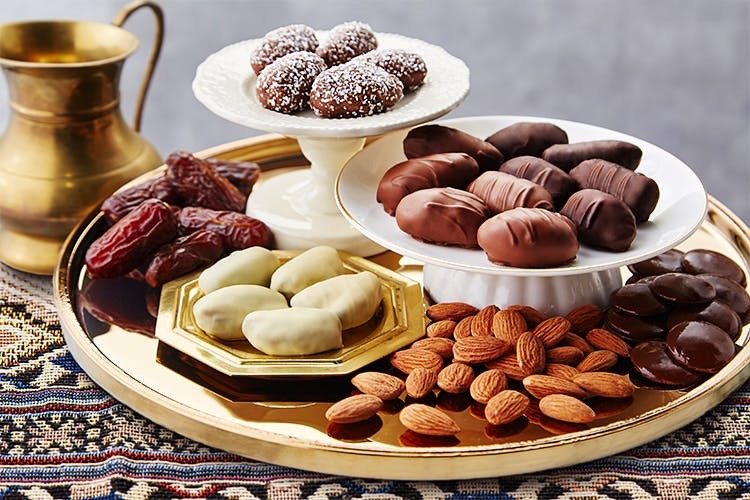 Middle East’s favourite bite-sized chocolate treats are finally in India courtesy Chocodates. These chocolate covered dates with an almond filling are tiny bites of heaven, TBH. Are you ready for the sweetest sugar rush? A little bit of chocolate is always good for the health (we aren't saying this, the studies are). Chocodates carry the sweetest surprise underneath its rich, chocolate-y exterior - luscious dates with almond fillings. So dive deep for your treat and get instant happiness! The best things in life come with a chocolate-y surprise, and this one surely has our attention. Lavishly chocolate-y on the outside, lusciously date-y on the inside, they are all set to take over the country by storm with their 3 sweetilicious variants—Coconut, Dark Chocolate and Milk Chocolate. Try one and you will feel like trying them all. No, seriously. Quit waiting and get your chocolate fix right away. These cocoa treats are now available across the city at retail stores including Modern Bazaar and Le Marche. Or, you can also log on to Amazon and get your dose of happy delivered. For more sweet updates, follow them on Facebook.